Algae-derived biodiesel could significantly reduce greenhouse gas (GHG) emissions and deliver a high financial return, whilst also providing a sustainable and realistic alternative to conventional oil according to new analysis from the Smith School of Enterprise and Environment. If algae-derived biodiesel were to replace the annual global production of 1.1bn tons of conventional diesel, a land mass of 57.3 million hectares would be required. 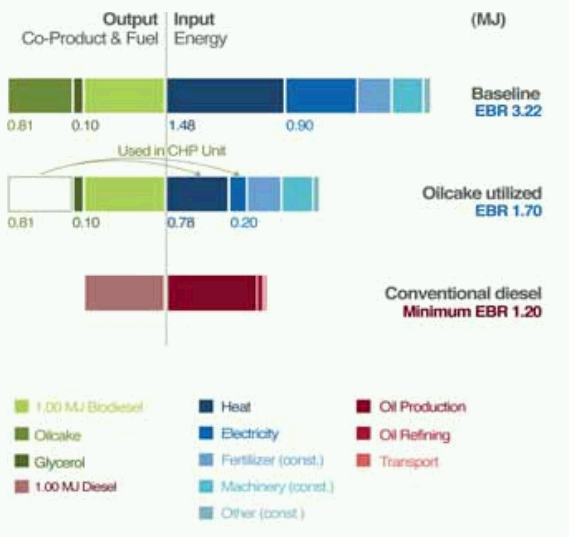 This compares highly favourable to other biofuels. The production process is the current barrier to large scale production. It is currently 2.5 times as energy intensive as conventional diesel, which restricts the current financial and environmental feasibility of algae production. The authors recommend various economic uses for co-products of algal oil production, such as using the residual oilcake to produce process heat and power, and the glycerol byproduct as animal feed. Even in the best case, however, using algae as an oil source for biodiesel production is not nearly competitive with production of diesel from conventional sources. And with the growth in gas-to-liquids technologies and coal-to-liquids technologies, algal biodiesel will find it hard to compete in the near to intermediate term. If algae is used as a biomass crop, however, rather than an oil source, any of the thermochemical or fermentation technologies for biomass-to-liquids conversion would work quite well with algal biomass. Even anaerobic production of methane could utilise prolific algal biomass -- although Al Fin energy analysts are not recommending anaerobic digestion as a primary energy production approach, given the current low prices for methane. Anaerobic digestion for purposes of waste disposal, with methane as a useful by - product, might be economical for specific commercial and agricultural entities. The bottom line: Most algal analysts are still looking at algae as an oil crop, when it will likely take between 10 - 15 years before algae can compete with other sources of liquid hydrocarbons on that basis. But if algae is looked at as a prolific biomass crop -- which can be grown in wastewater, saltwater, brackish water, etc. over 80% of the world's surface (including oceans) -- it should be possible to work up some proposals for nearer-term money making projects at small and medium scales. The bioenergy infrastructure is still in its nascent stages. Over the next 20 years, this infrastructure is likely to grow impressively, along with market conditions which are likely to become more favourable to non geological approaches to energy production.